Lead Photo: True Blue Tsunami 2018 Award winner Dylan Brown starts the day with a ceremonial and inspirational first swim. 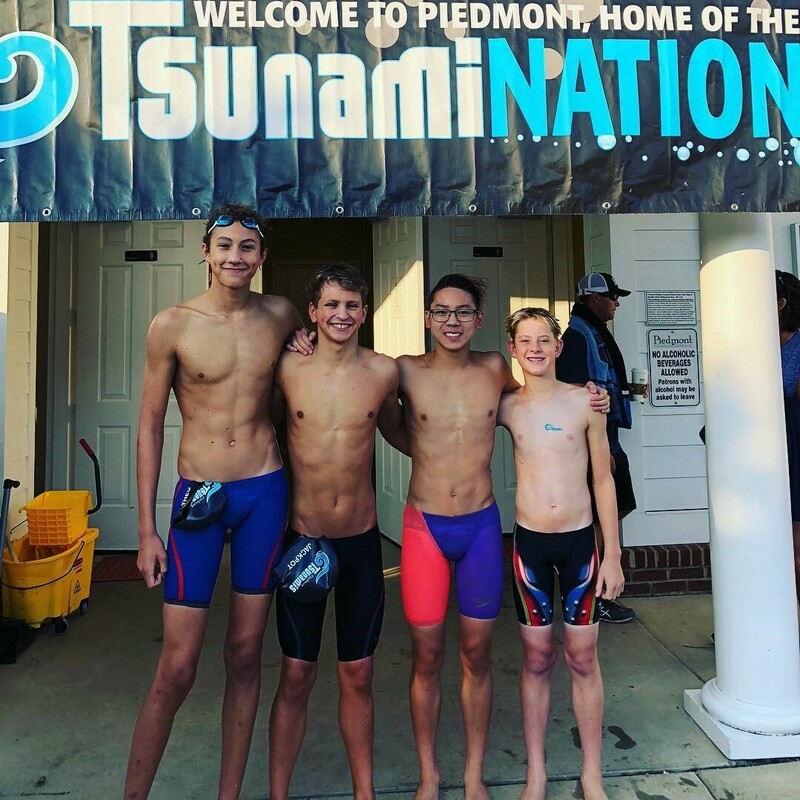 Closing out a summer swim season that was already packed with superlatives, the Piedmont Tsunamis finalized their quest on Saturday for top PWSL honors – finishing for the first time ever as Blue Division Champions, while also delivering an unblemished 7-0 record for the year. In a contest that would witness fierce speed and competition from all participants, Piedmont methodically cultivated an early lead throughout each stage of the divisional rivalry to claim the league championship with a total of 4097 points, followed by the runner-up Sudley Seahorses at 3835 points, and third place Braemar Blasters with a 3587 score. Tsunami Nation celebrates their first Blue Division PWSL Championship. The win was a historic one. The Tsunamis formally organized as a team in 2002, and have only participated in the Blue Division with consistency since 2014. Piedmont now becomes one of only three teams to collect the highest award for the Prince William Swim League. The day began positively for all three squads with an opening ceremonial swim that celebrated two young athletes who have recently been challenged by difficult health issues. Piedmont Tsunami Dylan Brown and Sudley Seahorse Michael Munsell lined up together and inaugurated the meet with a 50 Free sprint that provided an inspirational message of perspective, sportsmanship, and overcoming adversity for all participants. To earn the divisional title, Piedmont swimmers would be forced to outperform all prior efforts on the year by wide margins. Throughout the region, pool speeds were extremely fast with personal best times dramatically increasing to an average of more than 49% on the morning. Division rivals Sudley and Braemar would each outpace that benchmark to north of 60% speed improvements – driving the breadth of the Piedmont team to individually respond in kind if they were to close out the win. Here, the Tsunamis did not disappoint, having returned an astonishing (and league-leading) 69% faster grade versus prior times. That speed translated to another pinnacle of achievement for Piedmont, as individual and team best-times dropped at a scorching rate – with an unprecedented 24 total records surrendering to improved results. Long standing Tsunami scores first recorded by such notable alumni as Nick Tremols, Reni Moshos and Sophia Revilak fell by the poolside in an absolute assault on the top club positions. New Piedmont record holders for relay and individual events on the day included (with multiple records in parenthesis): Maddie Richardson, Katherine Crown, Alyssa Sagle, Elaine Hong, Emma Hannam (3), Kendall Rosenburg (2), Kara Wann, Camille Spink (5), Jana Gottschalk, Jessica Lee (2), Katherine Diatchenko (2), Morgan Furlong (2), Anna Dzouenko (2), Christian Mulroe (2), Christopher DeVito (3), Parker Treadwell, Patrick Hooper (2), Joseph Coleman (2), Theo Drescher (2), Matthew Pianoto (4), Jack Poleto (4), Davin Phe, Ryan Strotheide, Henry Radzikowski (3), Sebbie Borden (3), Luke DeVore (2), Eric Liao, and Tyler Michael. The Tsunamis crashed into new overall league record territory twice on Saturday as well. Early in the day, the Boys 13-14 200 Medley Relay team of Ryan Strotheide, Jack Poleto, Matthew Pianoto and Theo Drescher posted the first sub-2:00 score for PWSL with a new standard of 1:59.14. 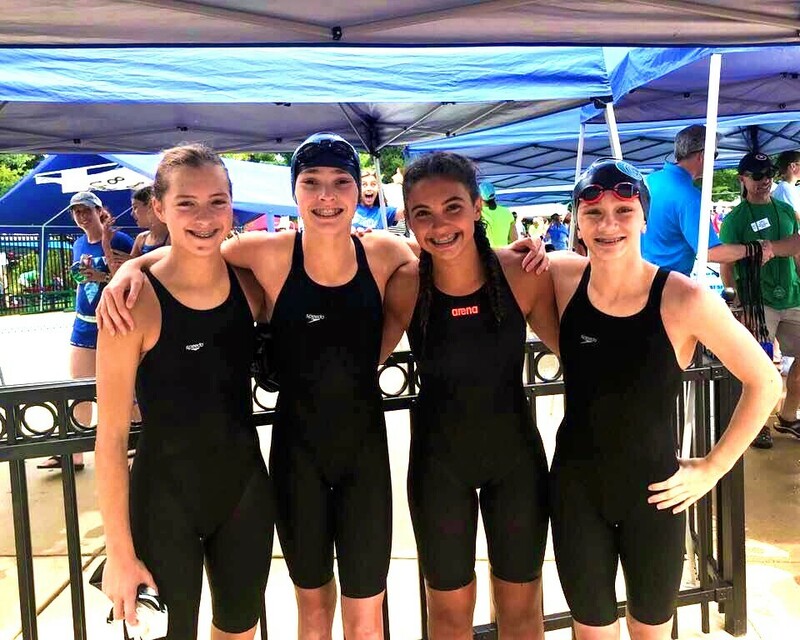 A few events later, the Girls 13-14 Freestyle swim would see both Camille Spink and Jamie Cornwell (SUD) compete to finish under the league mark, with Spink setting the new bar for PWSL at 27.31, or .5 seconds off the prior best from 2014. Spink ultimately broke Tsunami team records in all five individual and relay events she participated in throughout the morning. New record holders Kara Wann, Camille Spink, Kendall Rosenburg and Emma Hannam smile after breaking the team mark for the Girls 13-14 200 Free Relay. 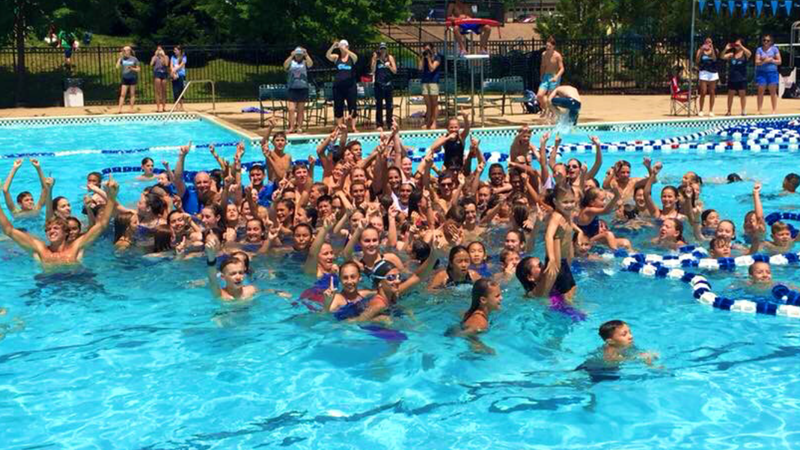 In combined team swims, Piedmont rallied to a lion’s share of 8 of 17 total relay wins. As the head-to-head contests unfolded, personal results would translate to yet another unique Piedmont accomplishment. Here, the Tsunamis captured a league-leading mark of 133 total Top Times in the PWSL Cyber Meet standings. Additionally, Christian Mulroe landed first place league accolades in all three of his Boys 8 & Under events (Free, Back and Fly). Blue ribbon winners for the team included (PWSL top times noted by number in parenthesis): Christian Mulroe (3), Abby Hubert, Elaine Hong, Camille Spink (1), Anna Dzouenko, Maddie Richardson, Luke DeVore, Katherine Diatchenko, Joseph Coleman, Blake Hayden, Christopher DeVito (1), Charlotte Hannam, Matthew Pianoto (1), Eric Liao, and Alyssa Sagle. The meet concluded with an anticipatory poolside dunking of Head Coach Jay Thorpe by an excited Tsunami home team who, along with returning Assistant Head Coach Nina Tremols and Assistant Coach Evan Brandt, celebrated on deck into mid-afternoon at the Piedmont Pool as they anticipated an official confirmation of the final score and tally. Piedmont Head Coach Jay Thorpe poses with Assistant Head Coach Nina Tremols and Assistant Coach Evan Brandt prior to the historic win. The Piedmont Tsunamis leave the 2018 summer campaign with renewed momentum, enthusiasm and excitement having successfully navigated their way to the coveted position of Blue Division Champions. We will next see the Tsunami wave rise in June 2019, as they look to defend their new title. 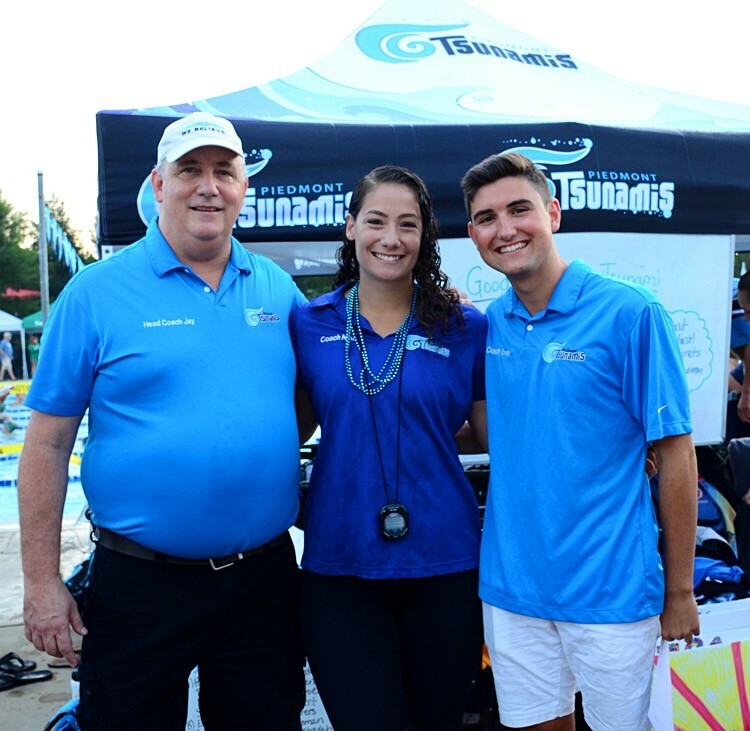 The Tsunami family sincerely thanks our fellow Blue Division members Braemar and Sudley, along with our incredibly supportive families, coaches, officials, sponsors, board members, and meet volunteers for another outstanding, and unparalleled, summer of swim.